Currently, in the top-30 of NHL scoring there are only five players in their 30s. The oldest is Martin St. Loius, who is 34. The others are Joe Thornton (30), Patrick Marleau (30), Jarome Iginla (32), and Tomas Kaberle (31). More than half of the players in the top-30 in scoring are 25 or younger. There are only seven players within the top-100 in NHL scoring that are 35 or older. If the Lightning feel disappointment over Lecavalier’s lack of current production, they should dread what he’ll look like when they’re paying him almost $8 million as a 39-year-old. There are very few cases where someone in their late 30s or early 40s can play at such a high level to command that much money. In fact, I can only think of one, Nicklas Lidstrom. Unless the NHL becomes a game dominated by older players, which doesn’t happen in any major sport, these deals will be burdens on their teams. I suppose in some cases there is an implicit understanding that these players will retire before their contract expires, allowing the team to alleviate itself from their cap pressure. Maybe that sounds good to the player now, but what about when they’re older and realize they have a free pay cheque waiting for them even if they are physically unable to play? 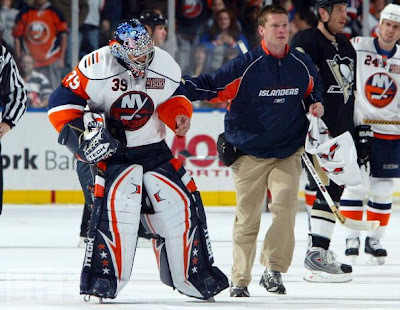 Rick DiPietro is benefiting from that now and he isn’t even 30. These deals represent the type of short-sighted nature characteristic of most GMs. The deals do allow teams to be more competitive in the short-term, but at a long-term cost. These deals allow teams to sign their stars at a lower cap hit, which allows them to sign higher talent to supplement these stars. So, since the window of opportunity in the NHL is brief these deals can’t be entirely trashed. But, if a team doesn’t win a cup during the time when their stars with long-term deals are productive, then they might be forced into a prolonged period of decline. Remember, there was a point when Alexei Yashin scored 94 points. There are no examples of successful teams that employ an unproductive player taking such a large amount of cap space. These deals can become especially burdensome if the salary cap decreases. I think more teams should follow the strategy of the Penguins, who signed both Crosby and Malkin to reasonable five-year deals. These deals will end when both players are in their late 20s and gives the Pens the flexibility to re-evaluate their talent at an older age. It also keeps both players hungry. I see no reason a 42-year old Marian Hossa will have the same desire to play at as high a level as he did before he hit unrestricted free agency. Even if he does have the drive, I doubt his body will be able and at that point the Hawks will be paying a lot of money for a third or fourth line player.